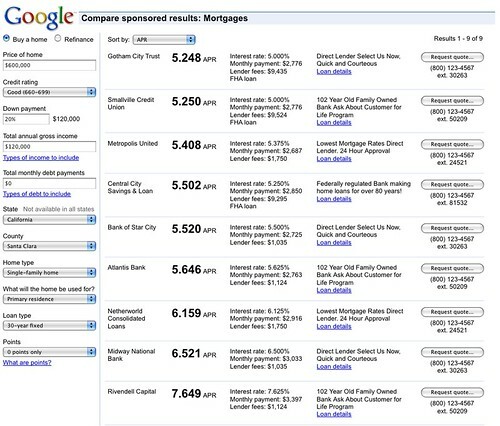 Google is launching a new ad type that they have been testing for a while, comparison ads within the mortgage and refinance industry. You can actually see it in action, with real data atgoogle.com/comparisonads. Danny has a much more involved write up at Search Engine Land. Note, Google has also began showing more real estate in Google Maps today. If you don't see it, that is normal because it is only available in "select U.S. states and is only available to a limited number of advertisers in the mortgage/refinance space." Also, advertisers pay on a cost per lead basis.